We were stationed in Iceland, the Land of Fire and Ice, for almost three years and saw the island at its best and worst at times. It was windy, cold, dark in the winter, required handrails on sidewalks due to ice and wind but it was a great tour! The people were helpful, liked Americans and treated us well. The land was always exciting with new adventures to see such as waterfalls, geysers, hot water lakes (such as the Blue Lagoon), beautiful geothermal heated swimming pools and much more! We visited Vestmannaeyjar (the home of Free Willy fame) and the ground was so hot in places the locals claimed they could bake bread on it! We also saw from a distance a smaller volcano that decided to erupt. Well a brother of that volcano is Eyjafjallajokull which erupted on April 16th with gusto and has since impacted the air traffic in and through Europe. In fact, it brought it to a standstill due to the amount of ash in the skies over the continent which did not allow air travel due to potential damage to jet engines. I met with the DoD Roundtable to discuss the impact of Eyjafjallajokull’s eruption on Air Mobility Command operations in and around Europe with Brigadier General Randy Kee, Vice Commander of the 618th Tanker Airlift Control Center. Most importantly, the discussion focused on the impact on the movement of wounded warriors from Afghanistan and Iraq to critical care medical facilities and the passenger and cargo movements in support of combat operations in both locations. In a good news story the Air Force planning cell at the 618th TACC has done an exceptional job of re-routing air traffic around the areas in northern Europe affected by the ash cloud! 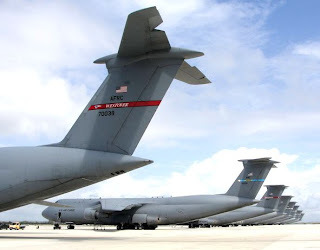 While many civilians waited in the European airports since the airspace was closed a week ago the Air Force airflow of C-5s, C-17s, KC-135s, C-130s and civilian contract flights continued through more southern locations such as Naval Station Rota and Moron Air Base in Spain. Since the new traffic routes were initiated by the TACC, the aircrews, maintainers, logistics, aerial port folks, medical crews, command and control functions and many others have worked extremely long hours to keep the traffic flow moving (Navy personnel at Rota were cited for their great support as well). With the airspace over Germany closed, the Air Force was unable to move wounded warriors through Ramstein Air Base for care at the Landstuhl Regional Medical Center located there. They placed extra aircrews and medical crews at Rota to continue moving wounded warriors almost non stop to stateside locations at Bethseda Naval Medical Center and Walter Reed Army Medical Center in the DC area and Brooke Army Medical Center in San Antonio, TX. At the time of the Roundtable yesterday afternoon, 57 wounded warriors had been safely and expeditiously moved through the new routing. 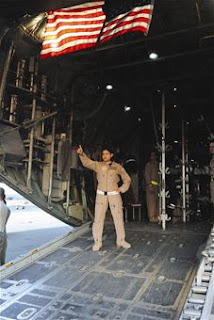 The wounded warriors were the focus but other combat support flights have moved 7,000 short tons of cargo and 23,268 passengers since the air space to the north was closed. That is 175 full semi loads of cargo and a large football stadium full of people! The southern routing does take longer due to the earth’s geography (widest part of the globe is at the equator so southern routes are more air miles than northern routes over or near the poles). With the changes allowing continued movement the average delay for passenger and cargo flights has been only 17 hours with no stranded passengers! Quite a success story for the airlift and tanker community! The sk ies are starting to clear with a reduced ash plume and General Kee said they will be meeting Friday to discuss when to return to the more economical and expeditious northern routes. Winds are forecast to move the ash to the north and east instead of southeast as well so a return to normal routing is expected as early as Saturday and no later than Monday unless the Land of Fire and Ice intervenes once again! If you would like to listen to this Roundtable or read a transcript, please go to DoDLive! Thank you Lt Cragg and DoD New Media for this opportunity to hear this great news! Note: The Land of Fire and Ice is again in the news! It is a beautiful place to visit and I highly recommend a stop over if you ever have the opportunity! By the way, the "jokull" at the end of Eyjafjallajokull means there is a glacier on top of this volcanic mountain!